tea in her hands in the late afternoon sun. Labels: Portrait with teapot. Tea on the couch. Acrylic on birch panel. 6 x 8 inches. Barbara Muir © 2014.
warm and cozy painting Barbara! You are so good at faces:) Have a great weekend. Nice work! I love a good cup of tea, you have described the feeling beautifully. Thanks so much. I am having a super weekend, and I hope you are too! Thank you. It's been a particularly long week, and driving home on Friday night I was aching for a hot cup of tea of cocoa. I'm a coffee drinker, but love sleep!!! 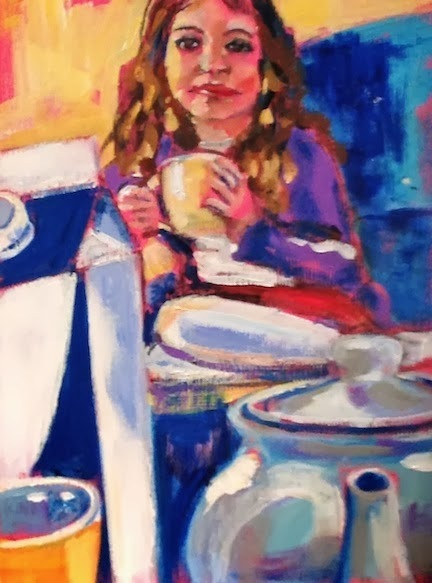 A delightful, tender homage to this little girl holding a warm soothing drink, which at this time of year makes more than perfect sense several times a day. Thank you so much. Yes at this time of year I could just spend my life standing over the kettle, making cup after cup of coffee, tea and cocoa. But not putting the cocoa on my face. That was funny when I went to the art store for a brush, and had to explain that it was for makeup because my other brush was full of cocoa! What can I say? The scientist's daughter. Thank you. Thank you so much. She is such a beautiful girl -- I loved this image. I'm glad that she was content. That's what I tried to capture.